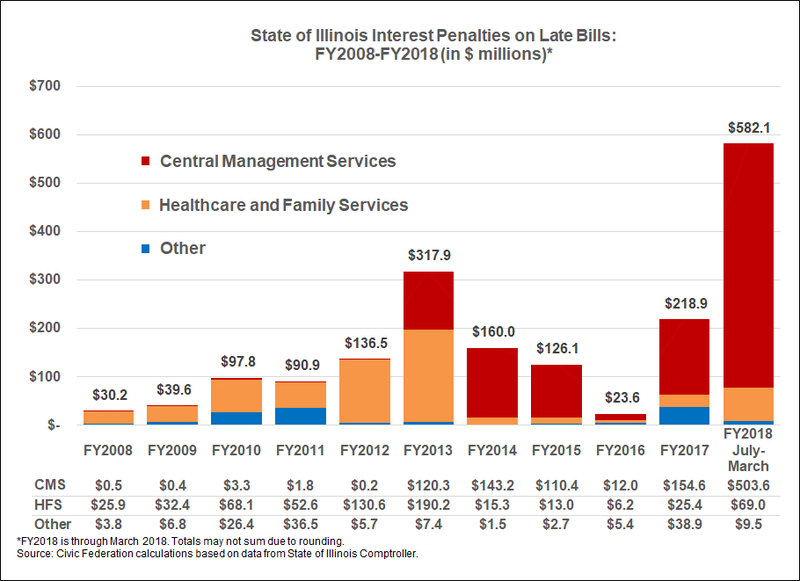 New monthly reports by the Illinois Comptroller’s Office provide the first detailed public information about interest penalties owed on the State’s mountain of overdue bills. As of the end of February, the State owed an estimated $983 million in late-payment interest, an increase of $96 million since the report was first issued two months ago. What do these numbers mean? Answering that question requires a quick lesson on Illinois’ bill payment process. At the tail end of the process, after the State pays the underlying bill, interest penalties are queued up for payment. 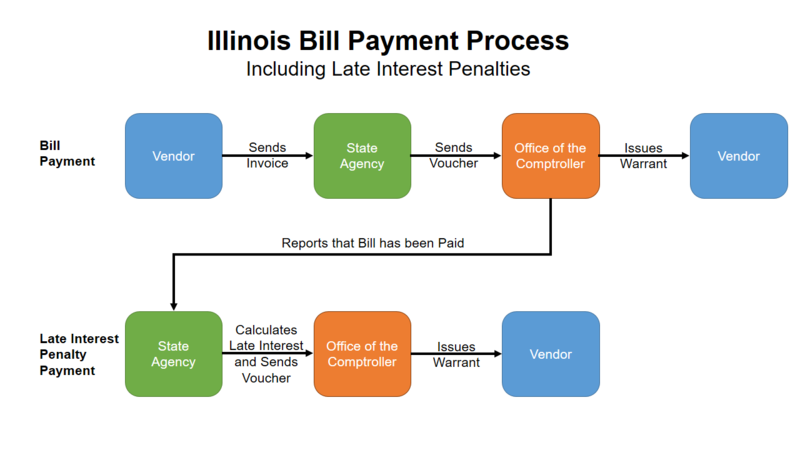 The diagram below presents a simplified look at how State bills are paid in Illinois, including late interest penalties on bills. A vendor contracts with a State agency and, after supplying goods or services, submits a bill known as an invoice. Once the agency makes sure the work was performed according to contract specifications, the bill is deemed to be valid. The agency can then send a voucher—a document requesting payment—to the Comptroller’s Office. After the Comptroller’s Office determines that the bill can be paid, it issues a warrant, the State version of a check, to the vendor. If the State paid its bills on time, the process would end there. But Illinois has dealt with its severe fiscal strains by delaying payments to vendors, social service agencies, local governments, school districts and universities. Delays can occur at several points in the payment process. For example, an agency may wait to send a voucher until it receives appropriation authority or is certain there is sufficient cash in the relevant State bank account. Similarly, a voucher may sit at the Comptroller’s Office due to inadequate cash or because other payment requests are given higher priority. Under the State Prompt Payment Act, interest accrues at 1% a month, or 12% annually, on certain bills that are not paid within 90 days after they are certified as valid. Other claims, including those from healthcare providers, accrue interest at 9% a year after 30 days under the timely payment provisions of the Illinois Insurance Code. Some payables, such as transfers to local governments and other State funds, are not eligible for penalty interest. The State pays interest penalties after it clears the underlying bills. As shown in the diagram, once the Comptroller’s Office informs an agency that a bill has been paid, the agency calculates how much is owed in interest penalties and submits a separate voucher to request payment for that amount. Interest payments themselves may be delayed for various reasons, including lack of cash and higher priority payments. The clock stops ticking on interest penalties after the underlying bill is paid; in other words, the State does not pay interest on interest. As discussed here, Illinois significantly reduced its bill backlog through the sale of $6 billion in bonds in October 2017. Additionally, the General Assembly’s tax increases enacted as part of the FY2018 budget have reduced the deficits that caused the backlog to grow during the State’s two-year budget impasse. Accordingly, the outstanding bill backlog has dropped from a high of almost $16.7 billion in November 2017 to approximately $8.6 billion now. Despite the reduction in the backlog, interest on outstanding bills continues to accrue. The first three monthly Debt Transparency Act reports published by the Comptroller’s Office have begun to shed some light on the changing composition of the backlog. The following table shows the amount of outstanding bills and interest according to their status in the payment process. It should be noted that the Comptroller’s reported Total Backlog includes both unpaid bills and final interest on bills that have been paid, but not interest accruing on unpaid bills. Backlogged bills have been paid down by $669 million, or 7.9%, from December to February. The Comptroller’s office reduced its pending bills by $727 million, or 10.9%, while bills held at agencies increased slightly. However, outstanding interest on bills that have been paid increased by $79 million during the same period. This suggests that the State is prioritizing payment of the underlying bills. This in turn has helped to keep the accruing interest on unpaid bills from accelerating during the period. Final interest on paid bills and estimated accruing interest together totaled $965 million in February. The numbers above refer only to bills and related interest penalties from the State accounts that have accounted for most of the payment delays: the State’s general operating funds and the Health Insurance Reserve Fund (HIRF), which pays group health insurance bills for State employees and retirees. The interest penalty numbers here are slightly different from the Comptroller’s numbers, which also include a small amount of interest penalties from funds other than General Funds and HIRF. The Debt Transparency Act report does not include the amount of interest penalties actually paid by the State. The Comptroller’s website has data showing expenditures on interest penalties, but these numbers refer to vouchers cleared by the Comptroller’s accounting system. Interest penalty vouchers may have been cleared, but payments are not made until warrants are issued. Warrants issued are not searchable in the online database. The next chart shows expenditures on late-payment interest penalties—representing vouchers cleared by the Comptroller’s Office but not necessarily paid—from FY2008 through March 2018. The total for the period is $1.8 billion, of which $582.1 million, or nearly one-third, was in FY2018. For the reasons explained above, the peak expenditures in FY2018 appear to represent interest penalties cleared—but not yet paid—by the Comptroller’s Office. About 87% of those penalties involved overdue bills for the group health insurance program. The health insurance program has been administered by the Department of Central Management Services since FY2013, when it was shifted from the Department of Healthcare and Family Services, the State’s main Medicaid agency. Group health insurance bills climbed during the State’s budget impasse in FY2016 and FY2017, when the program received no general operating funds. About $4 billion from last fall’s sale of backlog bonds was used to pay down group health bills. As a result, the amount of unpaid health insurance bills declined to $1.6 billion at the end of January 2018 from $5.2 billion in October 2017, according to a recent report by the Illinois General Assembly’s Commission on Government Forecasting and Accountability (COGFA). COGFA’s report also provides information about how long it currently takes the State to pay its bills. For group health insurance bills, the delay is as much as 309 days, still high but significantly lower than 734 days a year ago.